The Comprehensive Advanced Palliative Care Education (CAPCE) Program is designed to align with the Model to Guide Hospice Palliative Care: Based on National Principles and Norms of Practice (CHPCA 2002). CAPCE was developed in 2002 by the Palliative Pain and Symptom Management Consultation Program (PPMSMCP) of Southwestern Ontario. Consistent with the PPSMC’s reputation of providing the highest quality hospice palliative care education opportunities, in 2013 and 2017 CAPCE was redesigned to be reflective of best practice, evidence-based hospice palliative care and knowledge translation strategies in order to effectively meet the needs of the learners. This six month process was facilitated by experts in education design and knowledge translation, and informed by learner feedback, and local, regional and provincial clinical experts in hospice palliative care. 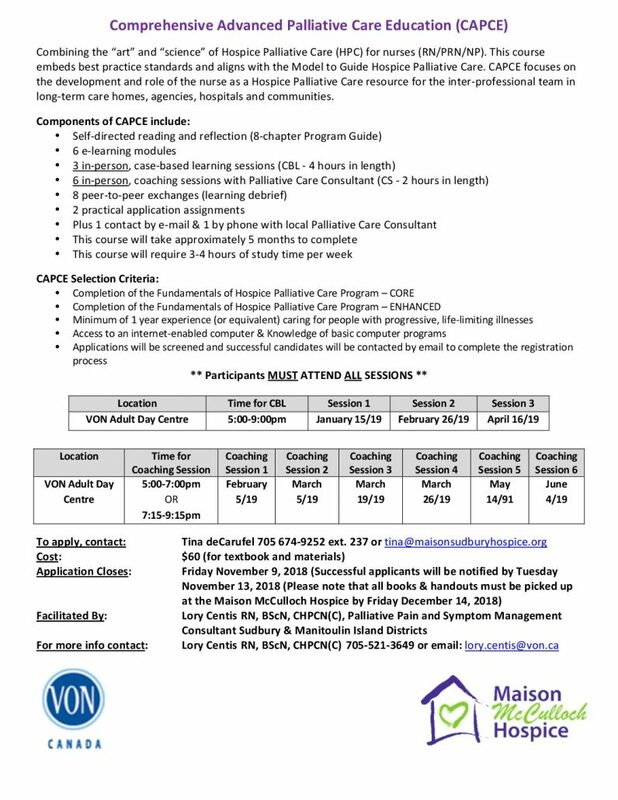 Following active participation in all components the CAPCE learner will practice as a competent hospice palliative care Resource Professional and support the development of skills among his or her peers. We have referred to this role throughout this program as the CAPCE Resource Nurse. Please note that this is not a professional designation, but rather a way to reference a skill set.